Well this never looked like a significant wintry event for us to begin with. It has always appeared as a weak system that would bring far western areas of Virginia as much as 1-3" of snow, with rain for everyone else. It has ended up being much less than even that. Let's take a look at what went wrong. 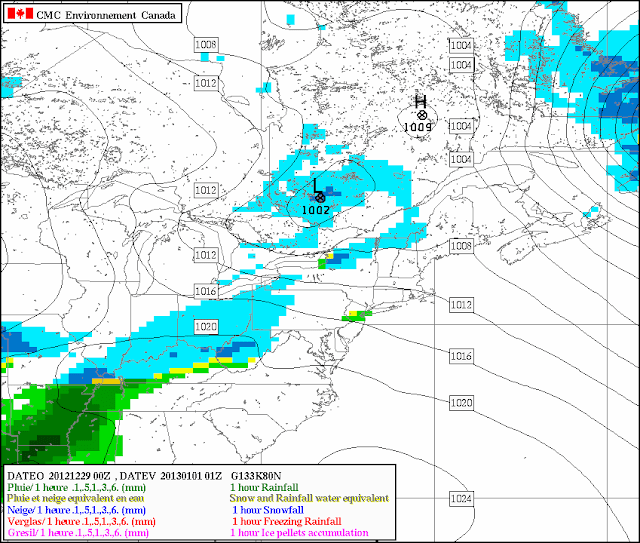 Here is the 12z nam model forecast from Friday, December 29 for early Saturday morning. Notice the primary low is over south western West Virginia at a pressure of 1006 mb, while our secondary low is over eastern South Carolina also at 1006 mb. These two features are close enough that they are combining to produce a large area of moderate precipitation for much of the Mid Atlantic. Many models showed something similar. Even with this setup, it still appeared that Virginia would be somewhat in-between the two systems, leading to a somewhat miniscule event. Now let's take a look at reality and how it actually played out. Here's the Storm Prediction Center's Mesoscale Analysis for 4am Saturday morning (what actually happened). Notice the primary low is still over southern West Virginia as modeled, but the secondary is a bit farther south (into eastern Georgia), a bit more elongated, and weaker. This took our "weak" precipitation shield that was expected, strung it out and made it even weaker. With the secondary low being farther south and more strung out than expected, that also allowed an area of dry air to work in along the southern side of the primary over southern West Virginia. You can clearly see this on water vapor satellite imagery. The whites and greens represent moist conditions in the atmosphere, while the yellows are dry air being sucked into the system. By the time that precipitation saturated the dry air mass in place and made it to the ground, the dry slot was already beginning to work into the area. This provided a long lull in precipitation that would not have been there if the secondary low would not have developed so far south and as weak. Counterclockwise winds around it would have provided easterly flow through our region, which would have kept this dry area locked out and precipitation locked in. It's also important to note that with the primary staying stronger over West Virginia longer, more warm air was allowed to wrap into the system, especially in about 1-2km up in the atmosphere. This prevented snow from falling, and instead changed many over to sleet and freezing rain for what little precipitation did fall with the initial batch. After the dry slot, all we had left to work with was the upper low that was spinning itself out just west of us. I mentioned on the facebook page that this would be the area for us to watch heading into this morning for some possible development. Well thankfully to avoid a complete bust, this did enhance some lift once it crossed the mountains, and provided a brief period of moderate to at times heavy precipitation for much of the Shenandoah Valley/northern piedmont of Virginia. It also brought in a cold pocket aloft which helped kick out the warm nose that had caused the mixing issues last night. This brought anywhere from a dusting to an inch for these areas. We'll have to wait on official reports from the National Weather Service to see if anyone did actually hit the forecasted 1-3" range. I think my forecast was lower than most, but still not low enough. The past two storms have really been text book examples of how minor changes in the track/strength of low pressure systems can greatly affect temperature profiles and eventual totals. Taking a sneak peak at our next possible storm system, here's the 00z gfs from last night for 1/1-1/2 next week. A storm system will dive into California off the Pacific this weekend before that energy gets transferred into Texas, eventually leading to the development of a low pressure center. Weak over-running of precipitation into cold air will provide the chance for some light snow/wintry mix. This isn't looking all that impressive at this time, but will be something to keep an eye on. Here is the 00z CMC for the same time frame, showing roughly the same setup. The cmc is a bit weaker with the over-running, and keeps it stuck on the western side of the mountains, a very real possibility as well. And finally the 00z Euro. Once again a very similar type deal. Same low over Texas. It can be tough to pinpoint where precipitation falls with these type of events because it'll all depend on where the front sets up. It's also worthy of noting that the pattern seems like a may quiet down for a short time after this system, but I guess we couldn't expect to keep having 3 systems in a week type deals. Keep checking back for updates.